Well, we had been going westward since Cartagena, because that's where we would find 3 possible shipyards for a much needed haul out, but we hadn't definitely decided yet on where to go after Eos' bottom inspection. But now, having seen the extent of work needed under water sometime in the (near) future, i.e. 3 new planks, plus expecting/fearing not to be able to find proper oak further east into the Med, plus expecting/hoping to do find proper oak in SW Spain or the Algarve, plus having heard good experiences about a yard in Olhão, etc etc, we finally made our definite decision: Westwards! 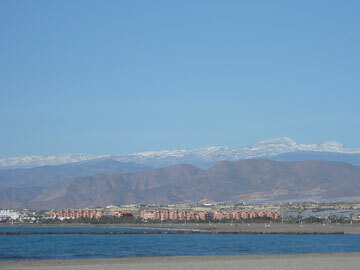 And so, with a forecast for a light SE'ly, we finally left Aguadulce for an easy relaxed 18 miles to Almerimar. At first we motored into a lumpy swell against a SSW wind. Off Punta Entinas the wind died completely but the waves transformed themselves into big rollers and they transformed Eos into a rocking horse. Fortunately by then the waves were behind us, but probably caused by the current which was 1 to 2 knots against us! A bit different kind of trip from what we expected... The poor ship's cat had lost her sealegs, as we could see from the puddle of puke on the floor. No wonder she was screaming to be let out. I myself spent only 2 minutes inside for a quick visit to the facilities. We passed a big Lagoon catamaran going in the opposite direction and Eos felt much more comfortable than that boat looked like. Double hulls = double bumps! Less than half a mile before Almerimar a lovely fresh east wind came up. Just what you need for manoeuvring into a berth. We'd hoped for a berth on an outer pontoon so as to have a bit of a cooling breeze, but the pontoons were either for much bigger or smaller boats, we were told. Not that they were filled up; let's just say the Spanish sense of business is different. And so we moored in exactly the same spot where we wintered in 2009/2010, with at least the advantage of an earlier disappearing sun in the evening. This is actually a picture from one and a half years ago in wintertime. Now, in summer, the view generally is much hazier, but there was still snow to be seen on these Sierra Nevada peaks in July.